Thanks! ... Seems like a "I-202" type of thing to me. IT IS THEREFORE DETERMINED that the request for financial assistance in the form of a grant submitted by the Hidalgo County Regional Mobility Authority meets the applicable requirements of 43 TAC § §27.53 and 27.54(a) and, in accordance with those provisions, and as an exception to the requirements of Minute Order 112605, the commission grants preliminary approval of the request for financing in an amount not to exceed $127,935,262, to cover certain costs of constructing Segments 1 and 2 of the State Highway 365 project, from west of FM 396 (Anzalduas Highway) and extending east and south to US 281 (Military Highway) in Hidalgo County. Since these three projects are not really Interstate 2 projects and developments regarding these three projects should dwarf Interstate 2 developments in the next few years, I decided to start a new thread about these three projects in order to avoid confusion with Interstate 2. I was not aware that so much was planned in the Valley. I have my doubts that any of these toll roads can be financially successful in that region, since the Valley is among the poorest regions in the United States and is more like Mexico in the United States. I'm thinking that financial plans must be contingent on truck traffic. My perception is that SH 68 will be built with frontage roads only in its first phase. There were numerous speakers protesting its alignment at a recent TxDOT commission meeting, but it seems like the alignment is still be adjusted, which may explain why it is so curvy. 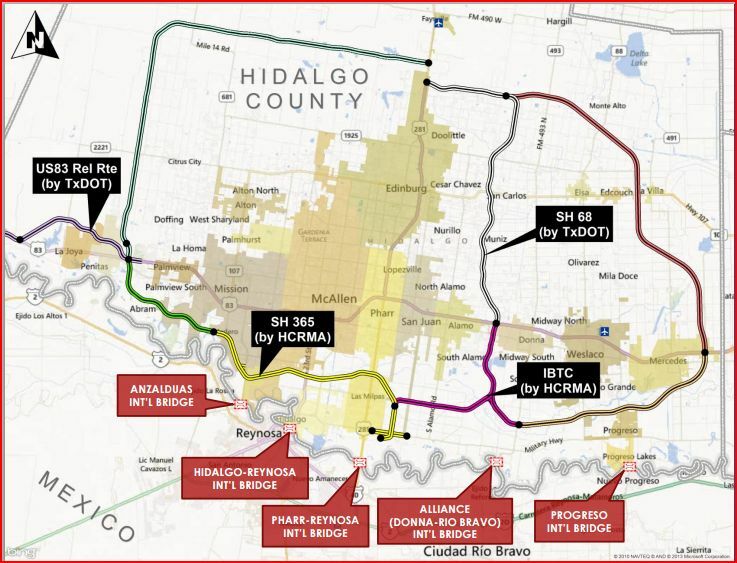 The Hidalgo County Regional Mobility Authority said construction of a new state highway will begin. State Highway 365 will be a toll road, connecting the Pharr International Bridge with the Anzalduas Port of Entry. Officials said the environmental phase for State Highway 365 was cleared by the Texas Department of Transportation. The 13-mile stretch of highway will be built just off of San Juan Road near the Pharr International Bridge. "Right now we have limited mobility in the county," said Pilar Rodriguez, Executive Director for the Hidalgo County Regional Mobility Authority. "In the east-west direction, we have Interstate 2, formally known as Expressway 83 and in the north-south direction, we have Interstate 69 which was formally known as U.S. 281 and that's pretty much the only... way to get to and throughout the county, and this works on expanding that." Passenger cars will be charged 20 cents per mile to use the toll road. Commercial vehicles will have to pay 50 cents per mile. Pilar Rodriguez said the cost for the new state highway is $245 million dollars. It's part of a bigger project that will eventually turn into 230 [video says 120] Mile Highway Loop System. The first phase of the project will start in late fall or early winter. Full construction is expected to start between 12 and 16 months. I was not aware that so much was planned in the Valley. I have my doubts that any of these toll roads can be financially successful in that region ... I'm thinking that financial plans must be contingent on truck traffic. 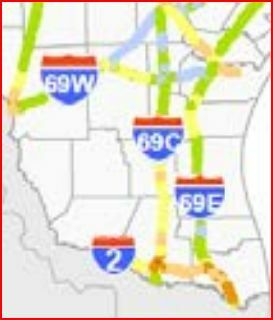 I suppose that Hidalgo County and TxDOT officials believe that the expected increase in periodic and regular congestion along I-2 and I-69C warrants the construction of the new projects in this area and that truck traffic will be willing to pay tolls to avoid the traffic. 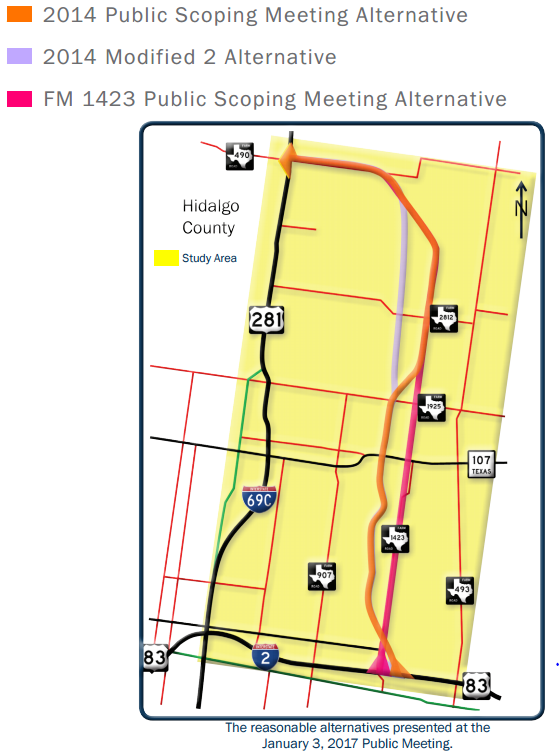 ... TxDOT will prepare an EIS for the proposed SH 68 from I-2/US 83 to I-69C/US 281, listed in the 2015—2040 Hidalgo County Metropolitan Transportation Plan as a 4-lane divided rural highway facility with the potential for main lanes and overpasses. There is no existing facility; therefore, the project is proposed on new location. The purpose of the project is to improve north/south mobility, increase travel capacity for local and regional traffic, and provide an alternate north-south evacuation routes during emergency events. The project need is a lack of sufficient north/south mobility for local and regional traffic and for additional emergency evacuation routes, which are the result of historical and continuing growth in the region's population as well as continued growth of traffic in the region. 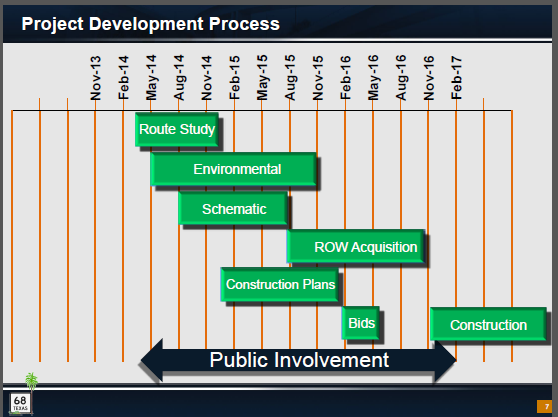 I also suppose that the timetable for the initial bid letting, if any, will be pushed back a couple of years. One of three sections of SH 365 is set to break ground Feb. 2 near San Juan as part of the project's first phase, Rodriguez said. Work on that segment will take about 18 months, he added. Two of Hidalgo County’s six points of entry — the Progreso-Nuevo Progreso International Bridge and the Pharr-Reynosa International Bridge — are equipped to handle commercial trucks. Rodriguez said SH 365 was proposed to help move those trucks. “The purpose of this road is to get traffic from the ports of entries into the county — and through the county — eventually to connect to I-69 Central or to I-69 East,” he said. The highway will span a little more than 13 miles between Mission and San Juan, according to Rodriguez. However, it won’t be free for travelers. The tolls, among other things, will help the HCRMA pay off the $250 million in development costs. The latter feature will allow overweight trucks to use the highway. This type of commercial vehicle is heavier than Texas’ limit of 80,000 pounds. SH 365 would accommodate trucks weighing up to 125,000 total pounds, which Rodriguez believes would offer several benefits to drivers. The HCRMA issued 14,400 permits for overweight trucks last year, which Rodriguez finds promising. At its eastern end, SH 365 will meet with the International Bridge Trade Corridor, which splits into a “wishbone,” as Rodriguez likes to call it. The International Bridge Trade Corridor is the next step in the multi-billion-dollar endeavor, Rodriguez said. The road will connect the Donna-Rio Bravo International Bridge to the Progreso-Nuevo Progreso International Bridge. The 13-mile stretch will also connect to Interstate 2 between Donna and Alamo. The highway’s design is about halfway done, but are pending environmental clearance among other things, Rodriguez said. He also stated that the HCRMA is about $150 million short to complete this road’s plans, but he is optimistic. With SH 365 estimated to take 30 months to complete and the IBTC scheduled for completion in 2020, the entire loop will take time to become a reality. Rodriguez believes it will pay off for drivers of all sorts. Anyone want to go to Fictional Highways, and give these toll roads Interstate designations? Hidalgo County officials gathered Tuesday to commemorate the groundbreaking of a massive project intended to better prepare the Rio Grande Valley for commercial trade — State Highway 365. The beginning phase involves building a 2-mile overpass at the intersection of Military Highway and San Juan Road. The overpass will also be connected to the Pharr international port of entry and the Border Safety Inspection Facility, explained Pilar Rodriguez, executive director of the Hidalgo County Regional Mobility Authority. The contract for the overpass was awarded last December to Foremost Paving Inc. Rodriguez said RMA estimates this portion should be completed in 18 months, but the construction company is positive about being able to finish in 13 months instead, Rodriguez said. The overpass segment is part of State Highway 365 and will be rolled out in two phases. The second phase, which connects the loop to the Anzalduas International Bridge, is scheduled to go out for bids in August, Rodriguez said. It’s a 13.3-mile project expected to cost about $165 million. Is there any plan to offer a direct connection between the southern end of I-69C freeway (at I-2/US 83) and the international border? 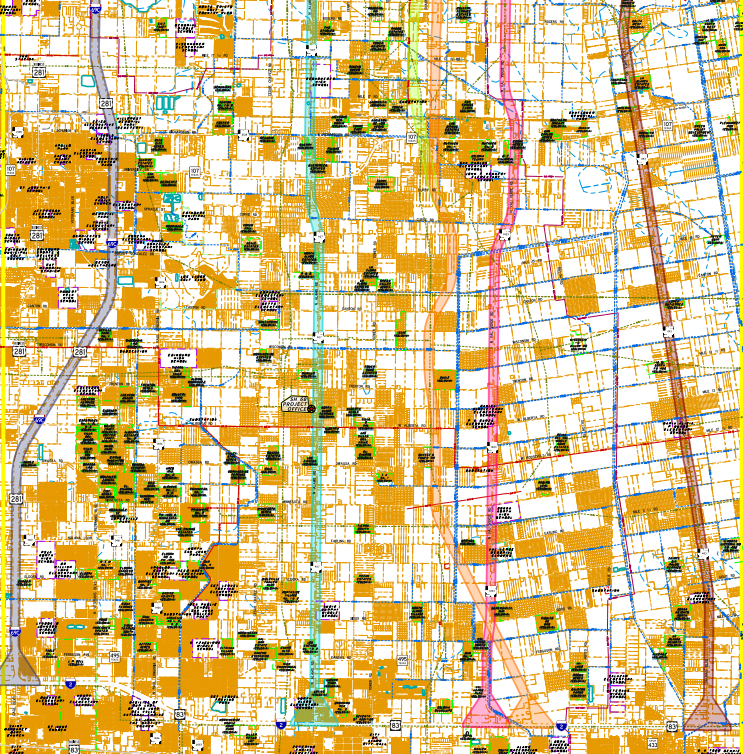 The map I see above seems to suggest the routes to the border will require a new belt route of sorts. I'd wondered if I-69C was intended to continue all the way to the border or not. 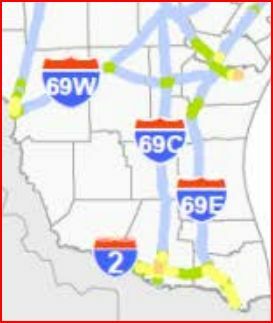 To make a long story short, the Congressional designation extends I-69C directly to the border, TxDOT has no current plans to extend I-69C from the I-2 interchange directly to the border, and lordsutch has put forth a plausible theory (conforming to the Congressional statutory language) that it can be considered as already having an "unsigned" indirect extension to the border. 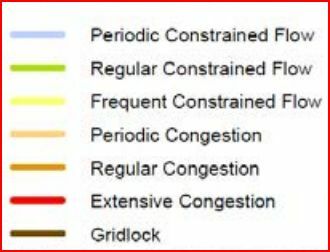 Also, TxDOT did not include the potential border to I-2 interchange direct segment of I-69C in its October 2013 US 281/US 59 Planning and Feasibility Study - Interstate (I-69C). The Texas Department of Transportation (TxDOT) will hold a Public Scoping Meeting for State Highway 68 (SH 68) to allow the public an opportunity to comment on the proposed project’s purpose and need, draft coordination plan, and other relevant project information. The Public Scoping Meeting will be held in an open house format between the hours of 2:00 p.m. and 7:00 p.m., on March 15, 2016 at the Donna North High School located at 7250 N. Val Verde Rd., Donna, TX 78537. No formal presentation will be given, but project staff will be on hand to provide information and answer questions. Attendees are invited to come and go at their convenience. Currently, the project is described in the Metropolitan Transportation Plan (MTP) and the Statewide Transportation Improvement Program (STIP) as a four-lane divided rural highway facility with future main lanes and overpasses in eastern Hidalgo County from US 83/IH 2 to US 281/IH 69C. The facility described in the MTP and STIP has a total project length of approximately 22 miles. The purpose of the project is to improve north/south mobility, increase travel capacity for local and regional traffic, and provide an alternate north-south evacuation route during emergency events. The project need is a lack of sufficient north/south mobility corridors for local and regional traffic and for additional emergency evacuation routes, which are the result of historical and continuing population and traffic growth in the region. Purpose: The Texas Department of Transportation (TxDOT) is hosting a Public Meeting for State Highway 68 (SH 68) to update the public on the project’s history, status, and next steps, including the presentation of the reasonable alternatives being advanced for further evaluation. Description: .... The project is described in the Metropolitan Transportation Plan (MTP) and the Statewide Transportation Improvement Program (STIP) as a four-lane divided rural highway facility with future main lanes and overpasses from US 83/IH 2 to US 281/IH 69C for a total project length of approximately 22 miles. 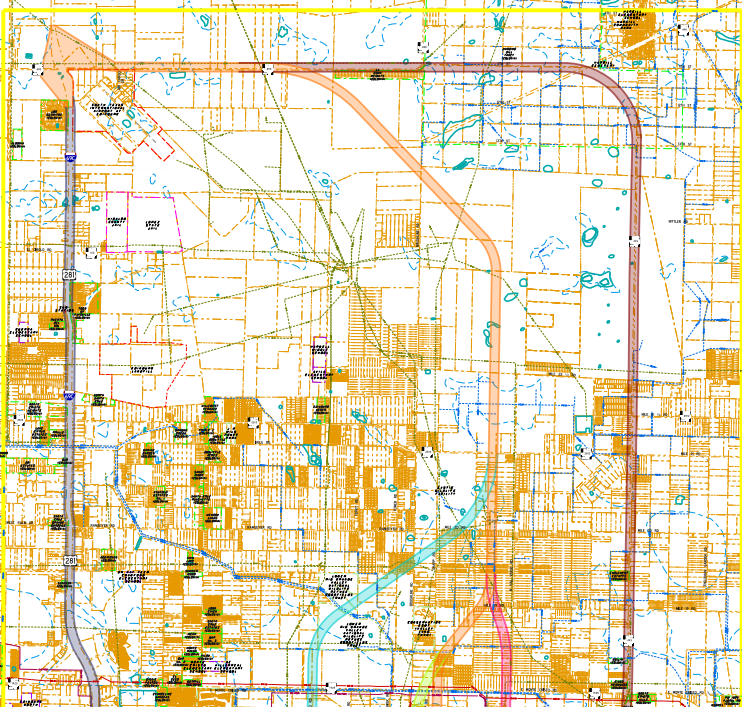 TxDOT has selected a route for SH 68 and the schematics can be found here. In addition, the Draft Environmental Impact Statement is also included. This April 5, 2018 TV video reports on a public meeting about SH 68.